Steve Mandell, the guitar player who joined Eric Weissberg on the hit instrumental "Dueling Banjos" from the film Deliverence died on Wednesday, March 14 at the age of 76. He had been suffering from prostate cancer. Born in Philadelphia, he was raised in New Rochelle, NY, graduating in 1959 from New Rochelle High School. He started playing guitar at the age of 12 but, before leaving his teens, had switched to banjo. 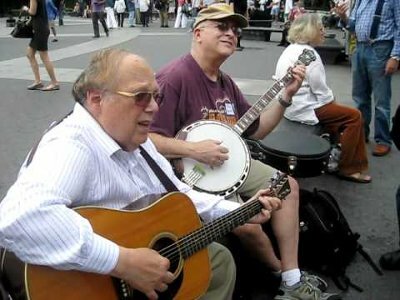 He started playing around Greenwich Village's Washington Square Park in the late-50's and started his first band, the Garrett Mountain Boys, which also included a young David Grisman. Within a couple of years, he started playing in Judy Collins' band and stayed with her until 1974 save for two years when he was in the service. In 1972, Eric Weissberg was asked to play a version of the song "Feudin' Banjos" which had been written in 1954 by Arthur "Guitar Boogie" Smith, for the movie Deliverance. Weissberg contacted Mandell and the two recorded the song before going to the set of the film to help the actors mimic the playing of the tune. "Dueling Banjos" became a smash hit, going to number 2 on the Hot 100, being held from the top by Roberta Flack's "Killing Me Softly". It did manage number 1 on the Adult Contemporary chart and 5 on the Country Singles. Even with a chart topping song, Mandell continued touring with Collins and, after leaving her band, worked in a variety of audio and video retailing jobs for J&R Music World, Grand Central Radio, Circuit City and Best Buy during the day and played music at night. He retired in 2006. Mandell is survived by his wife of 43 years and a son.